A polymer electrolyte membrane (PEM) fuel cell is an electrochemical device that generates electrical power by converting a continuous supply of fuel (e.g. hydrogen) and oxidant (e.g. oxygen/air) into a product of lower specific energy (e.g. water). The PEM fuel cell was developed primarily for automotive applications, capitalizing on its high power output, compactness, low temperature and scalable architecture. 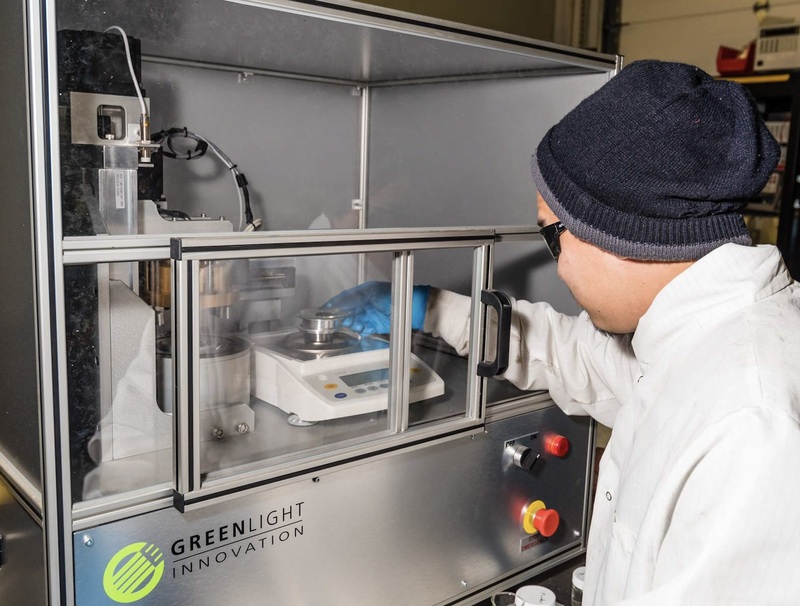 Fuel cell solutions are considered a “green” technology with substantial environmental benefits including high efficiency, reduced greenhouse gas emissions, low noise and improved air quality. Our research team at SFU recently established a strategic research partnership with Vancouver-based company Ballard Power Systems, a world-leading fuel cell developer and manufacturer. We are currently conducting a wide range of experimentation and modeling for design of next generation fuel cells. Another strategic focus is on fuel cell durability, with the goal to enhance the lifetime and reliability of fuel cells during real-world operation. 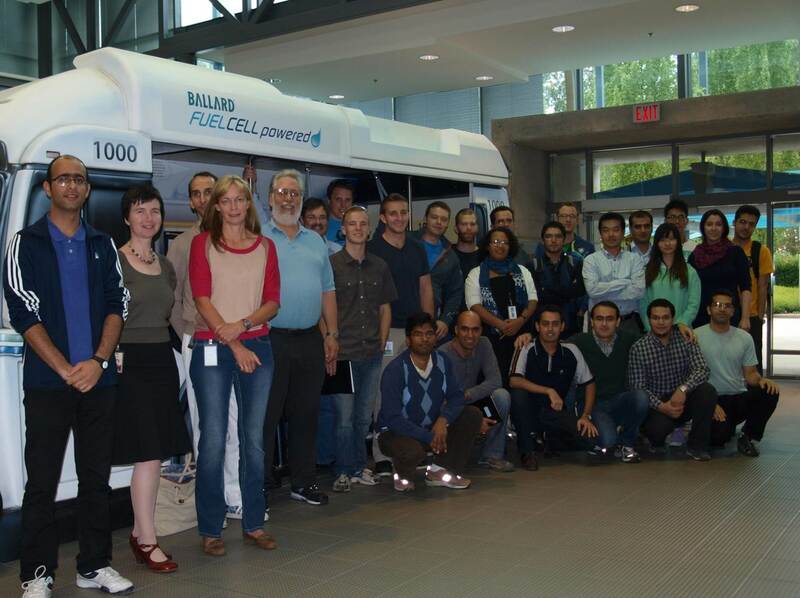 BC-based Ballard Power Systems launched a major research and commercialization project that aims to make fuel cell-powered buses competitive with diesel hybrids. Ballard collaborates with researchers at Simon Fraser University and the University of Victoria, with project funding through the Automotive Partnership Canada. A fuel cell bus is an electric vehicle which converts gaseous hydrogen fuel and atmospheric oxygen into electricity and water via electrochemical reaction. This new technology aims to reach zero emissions without compromising performance. Micro- and nanofluidic fuel cells represent a new fuel cell category that can be operated without a membrane and manufactured using inexpensive microchip assembly methods. More specifically, a microfluidic fuel cell combines all fundamental components of a fuel cell to a single microfluidic channel and its walls. In microchannels, the mixing of fuel and oxidant fluids is so slow that a membrane is not required for separation, and the fundamental principles of co-laminar streaming can be applied. 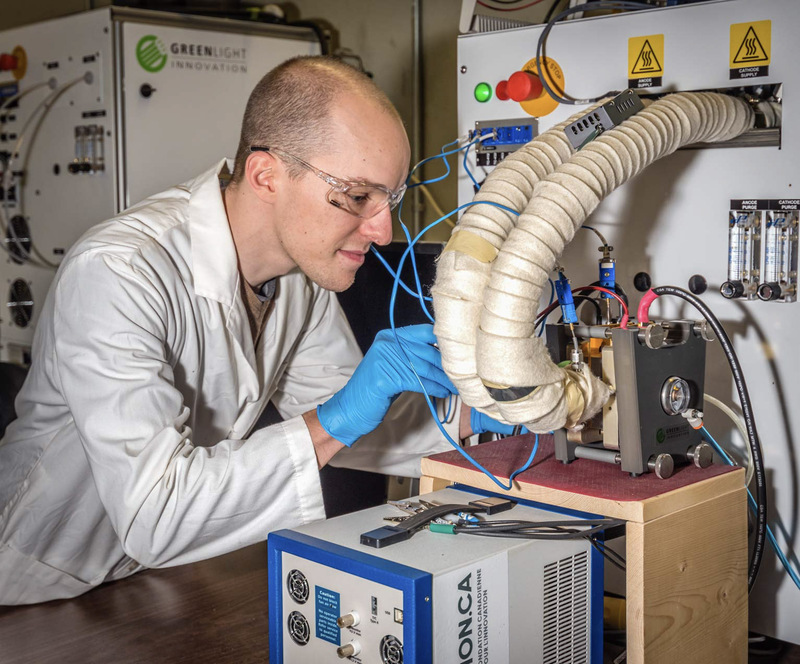 At SFU, we are developing microfluidic fuel cell devices with power output and efficiency levels comparable to existing fuel cell technologies, but at significantly lower cost. In one configuration, we demonstrated the use of common pencil leads as electrodes. During the Electrochemical Energy and Water Summit, held at the ECS Fall 2014 Meeting in Cancun, Mexico, the PowerPAD idea was born, a concept for an eco-friendly power source for water monitoring in low resource settings. The idea was awarded funding in the Science for Solving Society’s Problems Challenge in collaboration with Prof. Neus Sabate (Institute of microelectronics in Barcelona) and senior research fellow Dr. Juan Pablo Esquivel (Univ. of Washington) through ECS and Bill & Melinda gates foundation. 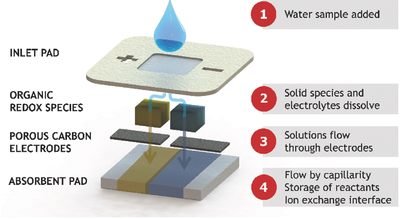 The concept leverages recent advances in microfluidic co-laminar flow cells with flow-through porous electrodes and capillary-based paper fuel cells. Using organic redox species and benign materials such as paper, beeswax and catalyst-free porous carbon electrodes, PowerPAD is a capillary driven, single-use, biodegradable power source. An analytical and numerical modeling framework is developed to support the research thrust in the areas of PEM fuel cells and microfluidic fuel cells. The fundamental understanding of transport phenomena in porous media is of great importance for both technologies. In this context, we are studying micro- and nanofluidic descriptions of fluid flow, electrochemical kinetics, reactant and product transport, heat generation and heat transfer; with the goal to provide guidelines and design tools for future fuel cell technologies. This research also encompasses a vital experimental component for model validation and proof-of-concept demonstrations. Advanced measurement tools and testing fixtures are under development in our lab. Hydrogen storage is a key technology for hydrogen energy utilization in fuel cells. Traditional storage methods include gaseous storage in high pressure compressed tanks or liquid storage under cryogenic temperature. While these methods are technologically plausible, their high cost and system complexity constrain practical use. Solid state hydrogen storage under room temperature and moderate pressure (below 50 bar) is a promising solution to the problems encountered by traditional methods. The hydrogen molecules stored in solid state hydrogen storage materials are attracted either by physical binding or chemical binding, which enables extremely dense packing even beyond the liquid state. 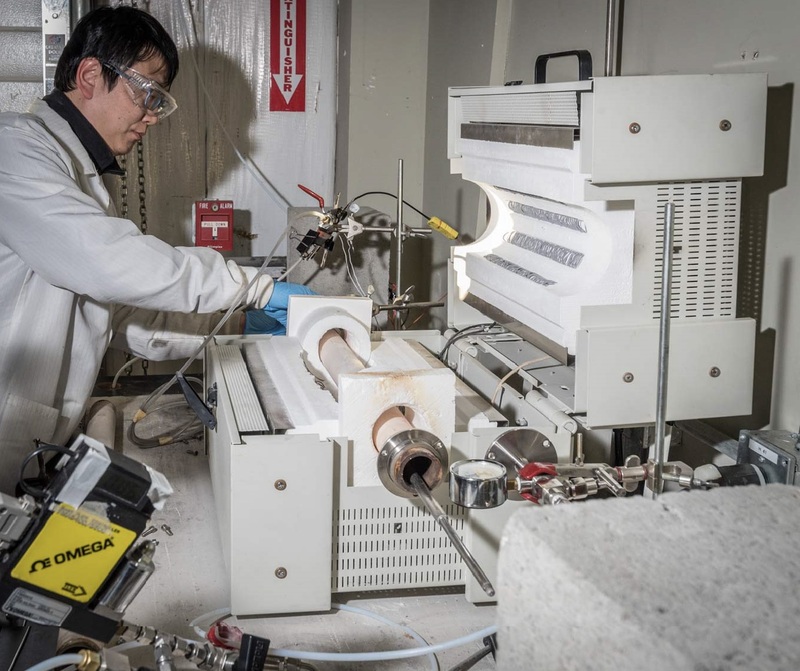 Our research team at SFU FCReL has partnered with Hydrogen in Motion to develop cutting edge solid state hydrogen storage materials by utilizing comprehensive theoretical and experimental approaches. 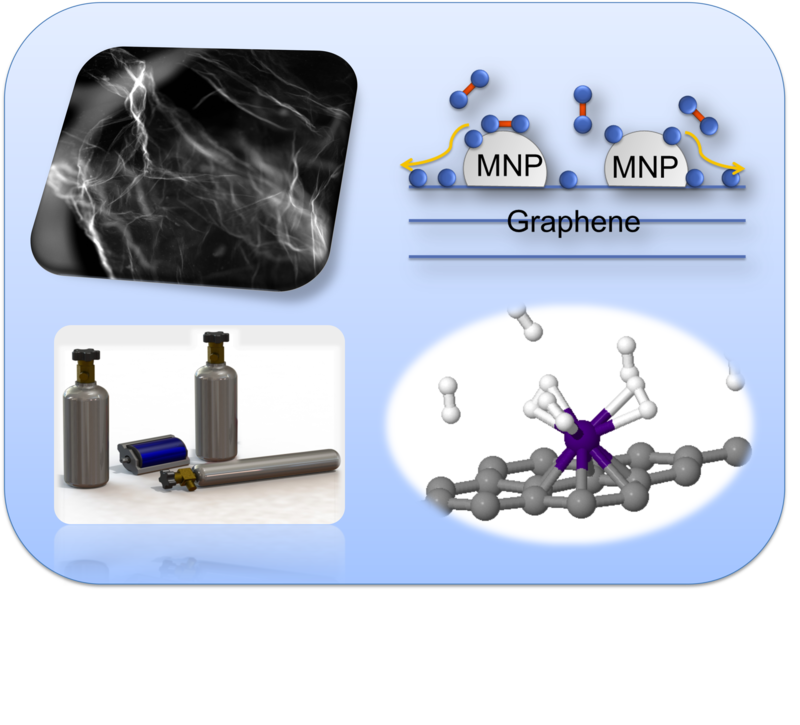 The materials investigated include two-dimensional layered nanomaterials and boron based hydrides.